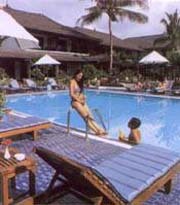 in the heart of Legian, Kuta, 1 mile from beach, 4.8 km/3 miles from airport. 124 rooms/suites, 3 restaurants, 2 bars, pub, swimming pool, shopping arcade. . The Legian Paradiso has 124 rooms in a two storey building arranged around a central pool in 2 hectares of lush tropical gardens. Built in 1994 in Mediterranean style, the property has been recently renovated and offers a choice of spacious single, double and three-bed rooms. Downstairs rooms offer a sun terrace and upstairs a pleasant balcony overlooking the pool or garden areas. - Room service is available 24 hours. All of the above rates are quoted in US Dollars, converted to Rupiah (Indonesian Currency) with the valid exchage rate on that day, 21% Goverment tax and service charge are included. No additional charge for children under 12 years old sharing the parent's room without an extra bed. Baby's cot/crib can be provided by the hotel upon request. High season surcharge US$ 10/room/night on june-aug & US$ 20 Dec 25 to Jan 5.